The provenance of the organ dates back to the 1920s. The physical evidence suggests the organ came from the Richard Bridge/Thomas Parker workshop, and was made about 1740, using some wooden pipes from about 50 years earlier. The organ was bought by Historic Royal Palaces http://www.hrp.org.uk/kew-palace/#gs.ueeYB5M for the newly restored Kew Palace in 2006 from St Paul’s United Reformed Church, Liss, Hampshire. The organ had been sold to a benefactor of the church in 1938, and moved to the newly built church in 1957. In 1922 the organ was bought by Seymour Powell, organist of Petersfield Parish Church, who bought it at a sale at ‘Fyning House’ Rogate, nr Petersfield. 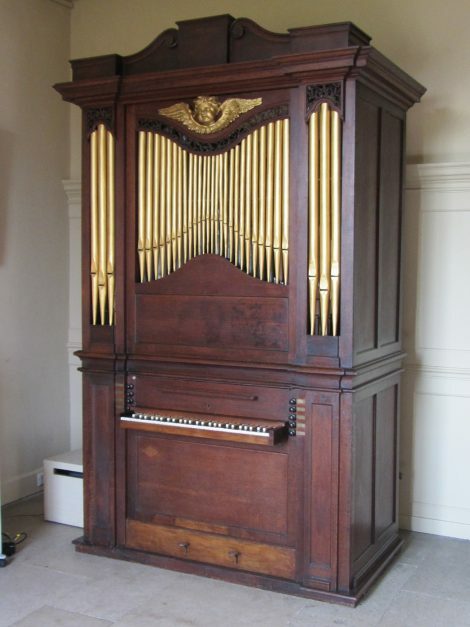 There is more evidence against its having lived all its life at Fyning House than for, though the organ was very dirty when Powell bought it at the sale of contents. On 30 October 1800, Richard Ridge of Fyning House instructs his executors to “sell and dispose of my organ and fire arms and such other part of my furniture as they in their discretion shall see proper”. The pipes of the Stopt Diapason and the Sesquialtera are wood and date from the second half of the 17th century, re-used in ca1740. On the reverse of the stop label for the Open Diapason bass is engraved ‘Voixhumaine’, and on the reverse of the Flute ‘Cremony’. The chest must have been made for a reed, divided bass and treble, for the holes associated with them in both upperboard and rackboard are still there, covered with the toeboards and plates for the change of mind. The organ is perhaps the earliest surviving Georgian chamber organ (another candidate would be the anonymous organ at Kedleston Hall in Derbyshire), and some parts show signs of the evolution towards the standard later 18th century Georgian chamber organ. The shifting movement was designed with its sliders above the stop action sliders (with a board between). The main puzzle was that the slider movement for the mixture is 9mm, whereas it is 17mm for Open, Principal, and 15th. There were pivot points for two pedals, but one of them seemed to be in an impossible position. There is now a pedal for the Sesquialtra-Cornet, and another for the rest, reducing to Flute and Stop Diapason. The keys slide outwards, though they do not slide back completely into the case and have a lockable cover. The music desk, which must be one of the earliest surviving on an English organ, consists of a shelf which slides out of a slot in the panel above the keys.